Gerry James used to use steroids. He used to be a bodybuilder. He used to be a pro football player. He used to be a professional wrestler. He used to be a long-drive competitor. James used to do and be a lot of things. Now, he's simply a golfer trying to find his way in his first U.S. Senior Open. James, 52, was born in Grand Haven and grew up in Fruitport. But he moved to California when he was 18 in search of something more. He wanted to be like Arnold Schwarzenegger and be a bodybuilding champ. "I was 18 years old and, you know, my dad at the time was an alcoholic, and I had a very low self-esteem," James said Tuesday after his practice round at Indianwood Golf and Country Club in Lake Orion. "And I (had) seen a picture of Robby Robinson, a famous bodybuilder on the cover of a muscle magazine. And I said, 'Man, I want to look like that guy.' I said, 'That dude, he looks like somebody.' "
James chased his dream and caught it, eventually becoming Mr. California in 1990. But he paid a steep price to get there. He used steroids and devastated his body. When his son, Justin, was born, James knew he had to change his ways. "I had a good chance that I wouldn't see him grow up if I kept on that track," James said. "Or I didn't know for sure, but you have to do the juice to win that level of a competition, and I did, and so I just quit." James also played football for the USFL's Oklahoma Outlaws. Then he became "Gerry America" and wrestled with Andre the Giant. "Wore a red, white and blue cape and had the red, white and blue Spandex and the big high boots," he said. He became bad guy Agent Orange in the WWF, but left. "I didn't like the atmosphere there," he said of Vince McMahon's circuit. James eventually found his niche in golf, and his salvation through faith. "And really I believe the Lord just replaced my competitive juices with golf, you know?" he said. "And it was long drive at first and now it's competitive golf as you see here." James, who is 6-foot-5, said his bodybuilding was an asset, and he knows with certainty that he was the longest driver in the world at one point. His longest record drive was 473 yards, 2 feet, 6 inches in Denver. Now he averages about 320 yards. 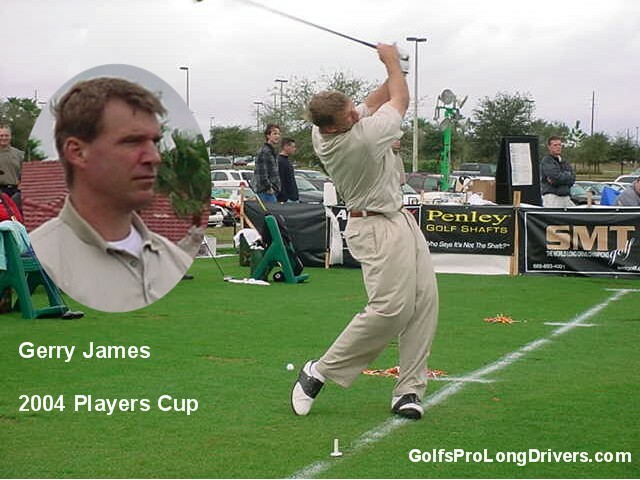 James is now a golf instructor in Ponte Vedra Beach, Fla. The discipline he gained in bodybuilding and his different careers have translated into golf. "This is funny, but I think the strongest part of my golf game is my putting," he said. "I'm a good putter. My driving is - it's driving and putting." James is a golfer, but he's still trying to find his way after leaving Michigan more than 30 years ago. "Well, I'm trying to figure that out, too," he said. "I am a golf instructor first and foremost. I've studied the game. Whenever I do something, I do it kind of to the extreme. I believe if you do something in life and you're passionate about it, you should go all in. And I'm not on afraid to go all in."